Spring has arrived at GSIB! I hope! For some reason winter keeps trying to hold on. This week there has been a few flurries, but stubborn me has already pulled out my sandals. LOL! Our family is wrapping up the last kid in hockey this month and everyone is itching to get onto the baseball diamond. We enjoyed our time at Elkhorn Resort for Spring Break! I had so much fun hosting their Kids Crafts again! We are already making plans for next year! Then this past week, we held our final Home Routes Concert of the season! Hard to believe this coming fall will mark 10 years of being a volunteer host! We have hosted 60 concerts in our 9 years! Watch for our next season to start in October! Concert dates and lineup are usually known by mid August. I ended the week with our cozy and Creative Spring Makery retreat! The ladies and I had so much fun and completely stuffed by all the good food. I'm so lucky to have my mom looking after all of our food needs at the shop! YUM! April and May is a very busy time for us as a family and at the store! I even hit the road a few times too! This coming month please note some special dates in the store, and if I'm on the road near you, so come say hi and visit me! April 17th to 23rd we will be have a facebook GSIB Spring Cleaning Auction - to clear out some items to make room for all the new stuff we will have coming! You will be able to bid on items and find some great deals! Easter Holidays! April 18th to April 20th we are CLOSED for family time! If you need Easter flowers, please order by Tuesday, April 16th for delivery by Wednesday, April 17th! May 6th to 11th is Mother's Day Week (We are closed Sunday, May 12th!!) We will have all types of fresh flowers and plants available! 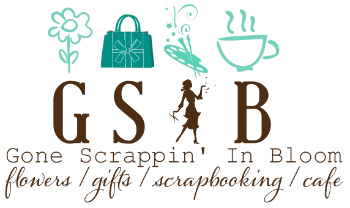 May 18th - 5th Annual GSIB Handmade & Vintage Market! It's also Rossburn's Town Wide Yard Sale and the store is open later! A definite must for a Road Trip! May 20th to June 5th, my dad, Dalyn and I are venturing to Urecht, Holland together! We can't wait for this adventure! Follow my journey on my facebook page! Don't worry, the store will be open! However, my Mom will be manning the fort so closing time may vary a little bit while I am away! Lunch will be sweet and simple as she is by herself most days! The ladies at the shop, (especially Kendra and Angela), have been super busy moving furniture around and freshening up displays! It looks amazing!! So welcoming and cheery! I made a little Spring Tour Video - so check it out below!! Boho Soul Komboucha (made in Minnedosa) is available in our cafe by the bottle! She has 2 great flavours right now! Blueberry Ginger & Raspberry Lemonade. Chaeban Icecream - made in Winnipeg and available by the pint jar! Deluca's foods including infused olive oils, prosciutto and more! More CBD oils, patches and salves. Including the bigger & stronger 2,000mg/30ml tincture bottle! Our new home decor & refinishing creative line - Prima Re-Design has been expanding with more Decor Transfers and we've been doing quite a bit of workshops, with more coming this summer! We are excited to partner with another small company - Dixie Belle Paint Company. We will be carrying their very affordable but awesome high quality chalk mineral paint products. We will have a small selection of their most popular paint colours and finishes, but can order other colours and will slowly grow our selection. They have over 64 colours and all blend to create new colours. They are located in Florida, but understand and champion small business values. As they are a small business too! Plus, they are the nicest people to work with! We are excited to pair our Prima Re-Design products and our mixed media plans with the Dixie Belle paint products. If using to refinish some vintage finds there is no sanding, priming or scraping required!! Yay - I'm personally so happy about this fact, for my poor fibro hands. They also have some unique products to apply paint to slick surfaces or those super grungy pieces you need a quick way to clean and brighten up. We will have how to's and tips on our social media pages and workshops coming up! Coming soon: Baltic Brothers Infusions (craft spirit kits & botanical infusions), Lend Me Some Sugar (Lotion, Lip Balms & Bubble Bath), Madeleine & Minou Soy Candles (high quality and great priced soy candles made in Brandon) and more! All of these new products will spark your imagination as you use them in your every day cooking, relaxing, up-cycling, home decor, art and more. So lets get the feeling of Spring happening and get inspired and creative in every day life! Come feed your soul at GSIB! !